I'll be your host for Wine Blogging Wednesday #46, the June 2008 edition of the online tasting event started by Lenn Thompson of Lenndevours. 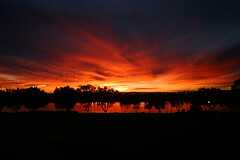 June marks the beginning of summer, and we will all be looking for white wines to carry us through the warm evenings. Some of the best options for summer white wines are made with one or more of the classic Rhone grape varieties: Bourbolenc, Clairette Blanc, Grenache Blanc, Marsanne, Muscat Blanc a Petits Grains, Picardin, Picpoul, Roussanne, Ugni Blanc, and Viognier. Wines made with these grapes tend to be aromatic, and can often rival your summer garden in terms of lush floral and fruity fragrances. At the same time, however, the wines can be crisp and refreshing, especially if there is some Picpoul in the mix. And Rhone white grapes are perfect partners for fish, chicken, salads, and all of the vegetables that are beginning to flood into your local Farmer's Market. Often Rhone grapes come in blended bottles of Marsanne and Roussanne, or some other combination, and blends are fine for WBW #46. Today, white Rhone grapes are planted throughout the world and I'm not fussy about where your wine comes from--I just want you to get out there and try some of these versatile, flavorful grapes. And, if you taste wines from more than one region (say one from Paso Robles and one from the Cotes du Rhone), you'll get top billing in the roundup. 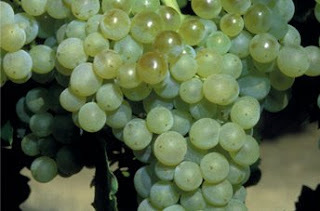 (image of Grenache Blanc from the Rhone Valley Wine website). I hope that even if you have never participated in Wine Blogging Wednesday before you will join me in drinking a white wine made with one or more Rhone grape varieties in June. Then, on or before Wednesday, June 11 write about your tasting experience(s) and post them on your blog, on the Wine Blogging Wednesday community site, or in the comments here at Good Wine Under $20. Don't have a blog or are feeling shy? Email me your notes, and I'll include them in the roundup. Just so that I don't leave anyone out, please drop me a line at goodwineunder20 (at) gmail.com with a link to your post after you make it, send me a message on Twitter with the link, or just plunk it in the comments here or on my June 11 post. The Rhone Rangers' list of white varieties, with descriptions of the flavors and aromas you can expect from each. The Rhone Valley Wine website has descriptions of the French growing region and excellent maps. Patrick Comiskey's excellent article from the August 2007 Bon Appetit magazine about why Rhone whites are the perfect wines for summer. Enjoy exploring the expanding world of Rhone whites, and I look forward to reading all your tasting notes and food pairing ideas in June. And if you're in the Los Angeles area, check your calendar to see if you can attend the Rhone Rangers tasting on June 4, 2008 from 6:30-8:30 pm. Forty-three wineries specializing in Rhone varieties will be there pouring wine at Raleigh Studios--so you may get to see a celeb or two. The cost is $60/person, and more details can be found here. You'll have a lot of tasting notes to share for WBW #46, that's for sure. What a lovely theme: a moment of relief from the hot days that have been wearing me out. I'll be there, God willing and if the creek don't rise. 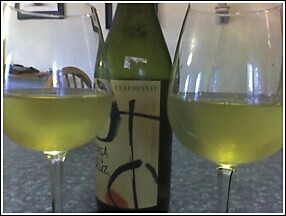 If our weather continues as cold as it has been, however, I may have to pair the white with a toasty Rhone red. I have not tried many Rhone whites, so this will be a fun way to explore! Thanks, everybody. I'm looking forward to reading everybody's notes--not to mention drinking some Rhone whites myself! I will add the second night tomorrow, in time for WBW. Thoroughly entertaining endeavor. Tasty wine as well, albeit a bit of an oddball. Hope you enjoy our write-up and photographs. Definitely great in dispelling the summer heat.